Using a well sanitizer twice a year can keep your well free from iron and bacteria build up. This improves the smell and taste of your water. 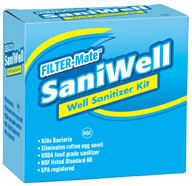 This product works in storage tanks, well casings, fixtures and pipes to help purify and eliminate harmful bacteria. Be sure to sanitize if you well has been contaminated or disturbed due to repairs.